The Pontiac car brand, once marketed as General Motors' "excitement division," will be killed off by the end of next year, the carmaker announced Monday. The fate of three other troubled lines - Saturn, Saab and Hummer - will be decided at a later date, GM said. They are likely to be sold off or shut down, while Pontiac will be shuttered. ICYMI: Bill Ford of Ford Motor Company on LKL last night! 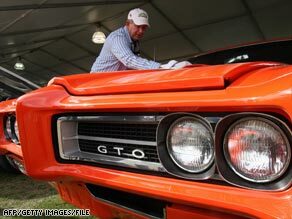 KING: There are reports, Bill, that GM plans to layoff 1,600 white-collar workers in the next few days, 1,600 white collar. Any layoffs at Ford? FORD: We have already - we have taken a lot of restructuring actions over the last year. We don't see anything coming on the horizon. I mean, we like our plan. We are working our plan. We are focusing very much on being a green safe company, which is where I think society would like us to go. Frankly, that's where I would like us to go. So our - our plans are working and we are just keeping our head down and going as hard as we can. KING: We know how competitive the automobile business is. Would you hire any of these former GM employees? FORD: Well, if we are in the hiring mode, sure we would. No. You know, we are now at sort of our fighting trim. And we are - we have the right structure for us to go ahead and deliver our plan. But there is no question, they're incredibly talented people at all the companies. GM and Chrysler both. So - great engineers. You know, should that time come, of course. KING: Were you surprised that Rick Wagoner was forced out? FORD: Well, you know, I guess I never thought I would live to see the day where the president - the CEO of General Motors was dismissed by the president of the United States. That to me was quite a moment. And whether or not that deserved to happen, I don't know. I mean, it is - that really is not for me to say.